The most rewarding part of traveling is often discovering the hidden gems of a city—alleyways lined with street art, the perfect spot to watch a sunset, a camera shop stocked with vintage lenses. The new location-based iOS app Trover makes it possible for users to share or find what it calls Discoveries—photos of and information about noteworthy sites and activities in any given place. For example, if you're in downtown San Francisco, you can see Discoveries for Rayko Photo Center's photo gallery, an iron sculpture of a man sleeping on W Hotel's roof, garlic fries from Bar 888, and a number of places to find graffiti art. Co-founders Rich Barton and Jason Karas created Trover to provide a personalized, crowd-sourced travel guide where you can get tips from friends, people you trust, or just locals who know a place best. Like photo-sharing app Instagram, Trover users can take photos within the app, follow one another, and browse through other users' uploaded Discoveries. Trover is much more than just images; you are also required to include a brief description and the location of an image. The app pinpoints them on a built-in Google map, making it easy for users to get directions to what's captured in the photo. Tover's interface is well designed and easy to understand. 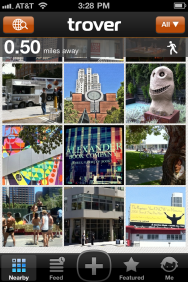 When it opens, you are taken to a screen called Nearby, where Discoveries close to your current location are displayed as a matrix of thumbnail images. As you scroll through the matrix, you can see how far away the various Discoveries are in the upper left hand corner. An icon on the right hand corner indicates if you are within walking, skating, biking, or driving distance. You can also search images based on a specific destination, filter images so you only see ones uploaded by people you’re following, or only view Discoveries that were added in the past week. Other browsing modes include Featured, which displays a list of editor-picked Discoveries, and the time-based Feed page that shows a list of most recently uploaded Discoveries. 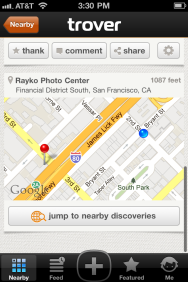 Clicking on an image opens it a larger view and shows who uploaded the Discovery, a description, a comment thread for that Discovery, and a map that's compatible with the standard iOS Maps app. You also have the option to “thank” the person who uploaded the Discovery, follow them, leave a comment, or share the item via Twitter, Facebook, or email. You can sign up for Trover through Facebook Connect, Twitter, or using an email address. 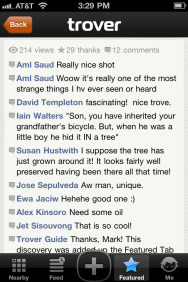 If you sign up using Facebook, Trover will automatically start following any of your friends who are also using the app. 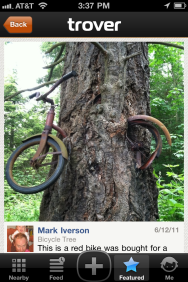 I signed up with this method, but found that I only had one friend on Trover. It's not a surprise since the app has been in trial mode for the past three months and only officially launched on Thursday. Currently Trover estimates that it has around 70,000 users in more than 150 countries. If Trover is to function as a go-to guide for a city’s nooks and crannies, it will need to get far more users on board. Barton and Karas acknowledge this, and are focused on scaling the community by creating Trover apps specifically for the iPad and Android devices, and organizing in-person events for people to connect with others in their area. Trover doesn’t have an extensive catalog yet, but it's on its way. The app is unique, and useful for anyone who wants to find the lesser-known treasures at any destination. Trover is available for free on the App Store and requires iOS 4.0 or later; there is also a read-only Trover website where you can browse exisitng Discoveries.